living room window. I was even able to go out and hold it. I didn’t think about it until now but I don’t recall seeing the same varieties of butterflies and moths that I saw growing up back in the Northeast. I wonder why? fireworks are banned. They had gone out and bought a big box of them from one of the local firework tents and were totally amped to set them all off. Colin also had a cardboard box of fireworks that he had stock-piled for the evening. After all of us had stuffed ourselves with awesome food and had a few drinks in us we began to set them off. There was a cute golden retriever next door which seemed a bit scared but thankfully a neighbor of Colin’s came buy and took him and two black labs for a walk. usual. Colin even invented a new game of trying to hook a ring onto a hook screwed into the wall with the ring dangling from a string several feet away... It was harder than it looked for sure. Colin of course had his ancient Original Nintendo game system set up in the garage for people to play but I think this party may have marked it’s death as after a while it wouldn’t play any games... booo! Once people started to get a bit tipsy so did the fireworks! Instead of pointing the bottle rockets at the sky Danielle decided to point them down the road. Needless to say there were a bunch that bounced off neighbor’s houses after that started! 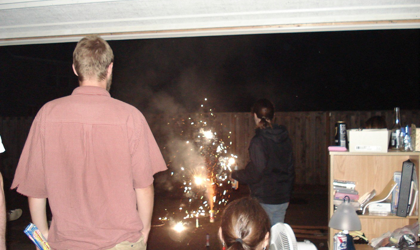 The Aussie’s had a great time with their box of fountain fireworks. By the time flip cup was announced I knew that I should probably leave as I still had a bunch of work to do on my research the next day and needed to be clear-minded to do so. Emily on the other hand was apparently just getting started so I left her to get a ride home with Scott and Danielle later. Once again Colin and Amanda through a great party at their house and their new backyard looked amazing as well.